Disclaimer: Follow these instructions at your own risk. If you screw up, it's not our fault. If you get hurt, it's not our fault. If you end up voiding your warranty, it's not our fault (get the drift?). If you don't feel comfortable installing these things, go back to the dealership, or ask a friend to do it. Verdict: A good styling modificaiton that has a purposeful use. Thanks go to the staff at Parkway Ford in Waterloo, Ontario who tracked down this elusive part and got it in my hands.. This part is listed in Ford's system as a 2000-only accessory. Be sure to specify the YS4Z, as this is the coding for the stainless steel plates. Anything else, you're asking for ugly pieces of plastic. Clean the area well with a good degreaser. Overspray from rustproofing, and road grime/tar tend to accumulate here. Follow the instructions on the bottle of degreaser. Ensure the area is dry. Unpack the pieces from the box. There should be two longer pieces of stainless steel (front doors), two shorter pieces of stainless steel (rear doors), and 4 packs of 3M VHB Surface Cleaner (one for each door). Place a strip of tape along the front-most interior joint of door sill trim. One edge of this tape should run along with the joint, and should be secured on the "non-ridged" trim.. Ensure that the tape is in full contact with the trim. Then, extend the tape until it touches the outer edge of the exterior door sill. Place another strip of tape along the rear-most interior portion of door sill trim. One edge of this tape should also run along with the joint. 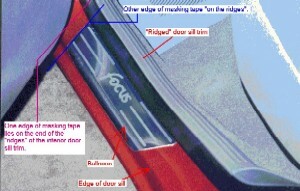 The 3/4" width of the tape should also run along the edge of the "ridges" on the door sill trim. Ensure that the tape is in full contact with the trim. Extend the tape until it also touches the outer edge of the exterior door sill. Dry-fit the plate. The plate should be centered between the two strips of tape, with the bullnose edge of the plate lying against the exterior edge of the door sill. The plate should also slide underneath the weatherstripping. You're ready to stick now! Open one package of VHB. Wipe the area where the plate is being attached. Remove 1/4 of the tape backing attached to the adhesive strip from one end, so that you have a dangling piece of backing. Once you are happy with its location, press firmly down on your plate, while making sure it doesn't move from the edge of the door sill. Start from the middle, and apply even but firm pressure out towards the end. These are a real pain to put in. 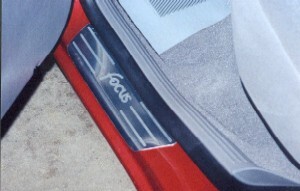 The door sill area is slightly curved on sedans and wagons, and the scuff plates are flat. There may be some "looseness" on the outer edge, as they may not entirely contour to the shape of the door sill area. 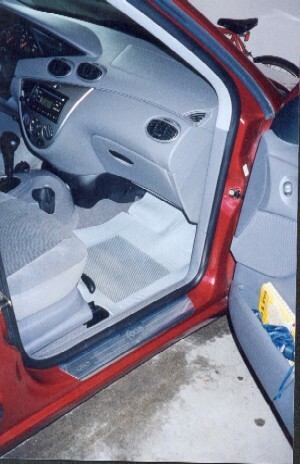 However, if installed properly, they won't interfere with normal operation of the rear doors. Note: We recommend buying a small roll of double-sided automotive tape to ensure these plates do not come loose. You can cut a strip of tape to go alongside that already found on the plate to help it "stick" better to the surface. Attach a piece of tape along the edge of the ridges closest to the B-Pillar. The width of the tape should be on the ridged trim. Ensure that the tape is in full contact with the trim. Then, extend the tape until it touches the outer edge of the exterior door sill. Dry-fit the plate at this stage. 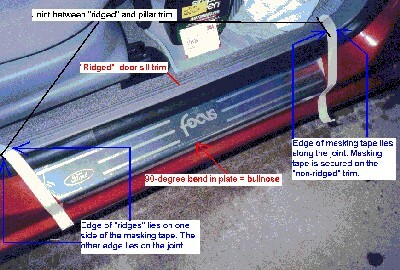 Ensure the bullnose is against the edge of the door sill, and is underneath the weatherstripping. Here, you may want to use another piece of masking tape to mark the other side of the scuff plate. Remove the tape backing attached to the adhesive strip. Gently place the scuff plate onto the surface, making sure the bullnose is lying against the edge of the door sill. Once you are happy with its location, press firmly down on your plate, while making sure it doesn't move from the edge of the door sill. You must start from the middle and keep it against the edge of the door sill! Apply even but firm pressure out towards the end.